Meghan Moe Beitiks is an artist working with associations and disassociations of culture/nature/structure. She analyzes perceptions of ecology though the lenses of site, history, emotions, and her own body in order to produce work that analyzes relationships with the non-human. She was a Fulbright Student Fellow, a recipient of the Claire Rosen and Samuel Edes Foundation Prize for Emerging Artists, and a MacDowell Colony fellow. 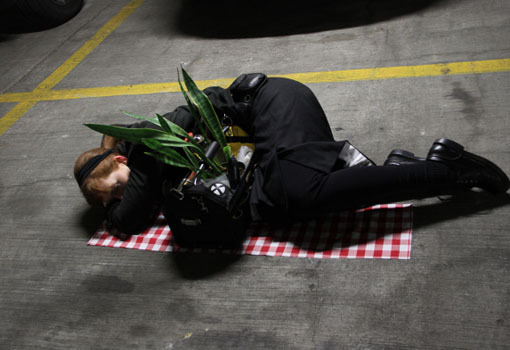 She has taught performance at the School of the Art Institute of Chicago and exhibited her work at the I-Park Environmental Art Biennale, Grace Exhibition Space in Brooklyn, Defibrillator Performance Art Gallery in Chicago, the Victoria and Albert Museum in London, the House of Artists in Moscow, and other locations in California, Chicago, Australia and the UK. She received her BA in Theater Arts from the University of California, Santa Cruz and her MFA in Performance Art from the School of the Art Institute of Chicago.